Rotary Club of Leeds Elmete - Welcome! Church Lane, Bardsey, Leeds. LS17 9DR. 7.00 pm. for 7.30 pm., every Thursday (except two Thursdays around Christmas). For directions and map, CLICK HERE or scroll to bottom of page. 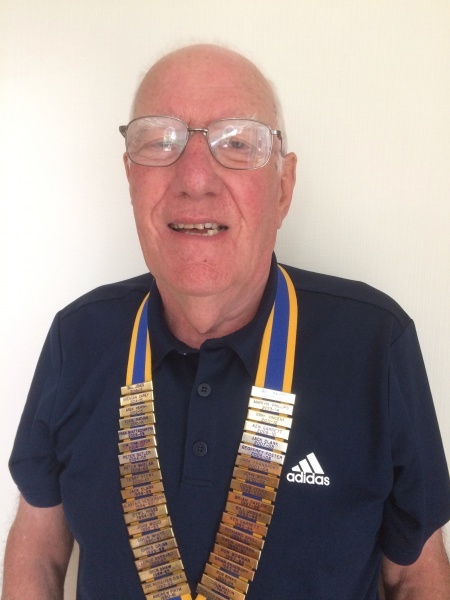 Our President for 2018-19 is Rotarian Alastair Henderson, PHF. Retired from his work in building services and is an ardent golfer. Alastair was awarded a Paul Harris Fellowship by the Club in March 2017 for his services to Rotary and the Club over the years. He has been a member of the Club since January 1986, and this will be his second term as Club President. Alastair was handed the President's jewel by outgoing Immediate Past President Peter Whelan at the 'handover' on 5th July 2018. President Alastair and Members will be delighted to welcome visiting Rotarians and guests to our meetings. Please advise by phoning 0113 267 2925). It's that time of year again, and we are seeing the fruits of our labours. 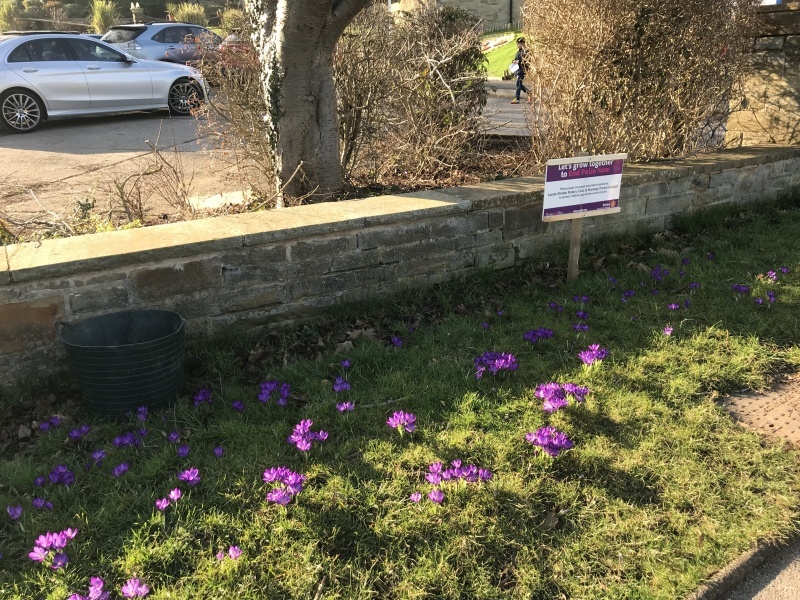 The Purple crocuses we have planted in and around Bardsey Village and The Primary School are beginning to bloom.The pictures show our 3 sites. 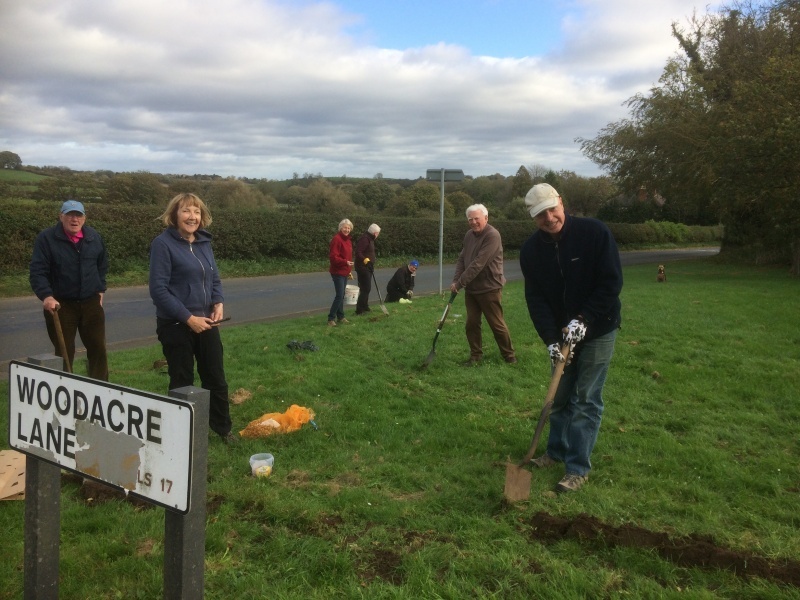 President Alastair, his son Gordon, along with Rotarians Bill Jones, Jim Tomlinson and Peter Whelan joined three members of Bardsey Parish Council in the late morning of 30th October and planted about 4000 purple crocus corms in the grassed area around the bus stop at Grange Close on the A58 (Wetherby Road) in the village of Bardsey, Leeds. 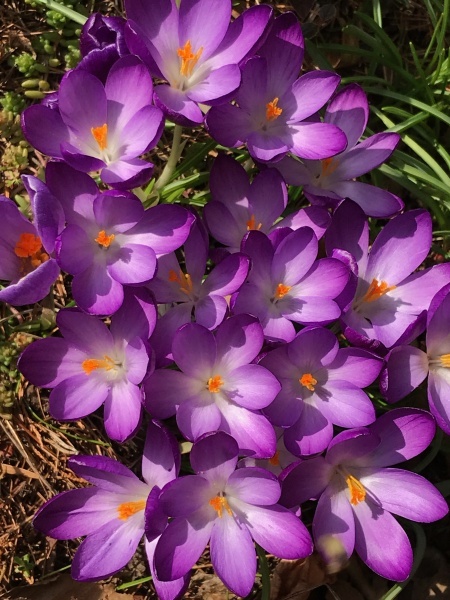 Hopefully this will result in a spectacular show in the spring, and attact some publicity for our Purple for Polio campaign. We also donated about 1000 bulbs to the local Primary School for the students to plant in the school grounds next week on their return after half term. See lower down the page for previous posts on this subject. Once again, as in many previous years, a number of our members gave a donation to Lifestraws (or other worthy Charities) in lieu of sending Christmas cards to each other in 2018. Thursday 13th December saw members, their partners and guests attend the Club's Christmas dinner at the Bingley Arms. A jolly good time was had by all. The food was excellent, as was the company. After dinner we were treated to a light hearted quiz, as usual drawn up by Past President Martyn Phillips, and then the culmination of our 100 Club with the final draw of the year, the lucky top prize winner walking off with £100. The evening concluded with President Alastair wishing everyone a Merry Christmas and a Happy New Year before proposing the final toast of 'Rotary and Peace the World Over'. The following evening saw 4 of us back at the Bingley Arms to sell tickets for our Annual Whisky Draw for a Gallon bottle of whisky. Tickets (2 for £1, but preferrably in blocks of at least 10) flew off the board, and thanks to the massive gererosity of the patrons of the Bingley Arms, we were able to announce the winner at about 8.30pm. 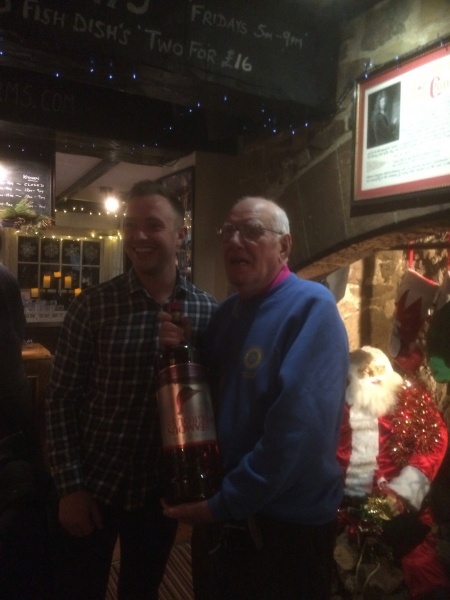 The winner this year was Mathew Wells and the picture below show him recieving the bottle from President Alastair. Congratulations Mathew, do enjoy. We were touched by the generosity of the people there that night, and thank Ryan and the establishment for allowing us to perform this 'draw' which contributes to our Charitable Giving Funds each year. 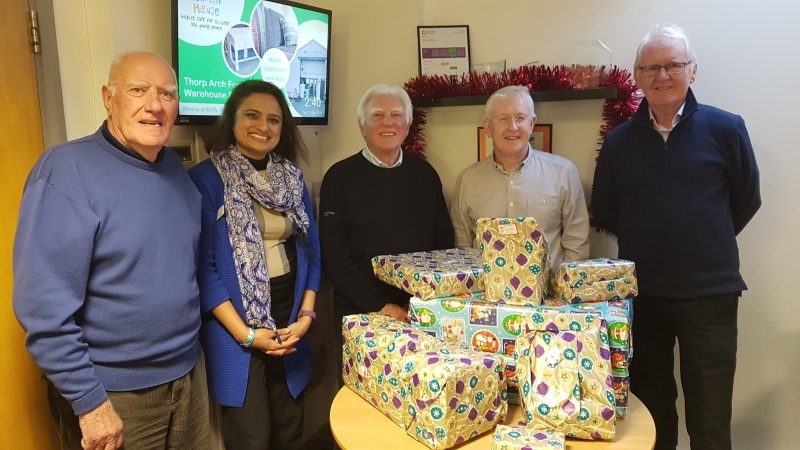 President Alastair and a number of Rotarians visited Martin House Children's Hospice on Tuesday 11th December 2018 to deliver Christmas gifts for the children, as we have been doing for many years. We send our Love and Best wishes to the Children, their Siblings and Parents wishing them all a very Happy Christmas. We also thank the Staff for the dedicated and wonderful work they do, and hope that they have an enjoyable Christmastime too. 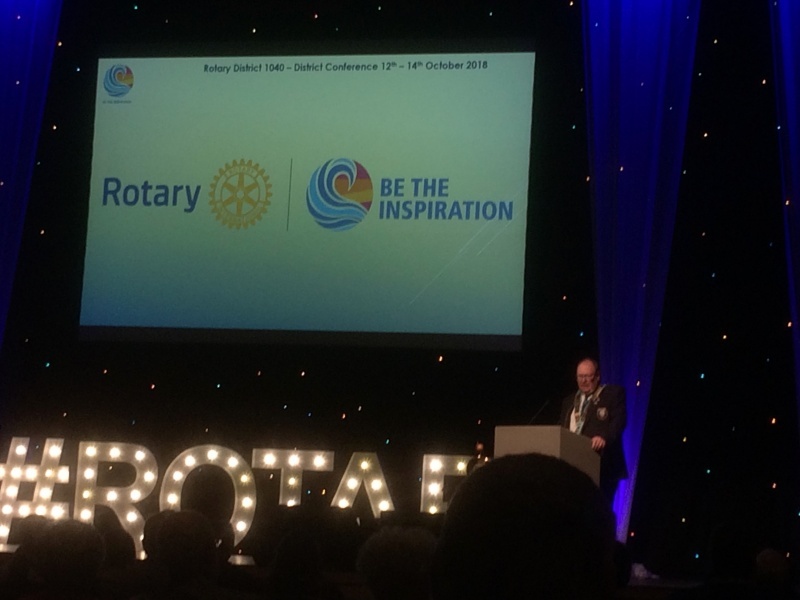 President Alastair and Rotarian Bill Jones attended Conference as 'Day Delegates' again this year. We arrived on the Friday afternoon to lowering skies and the odd spot of rain - while the rest of the west of the UK was battered by storms. A difference to last year when it was walm and sunny. 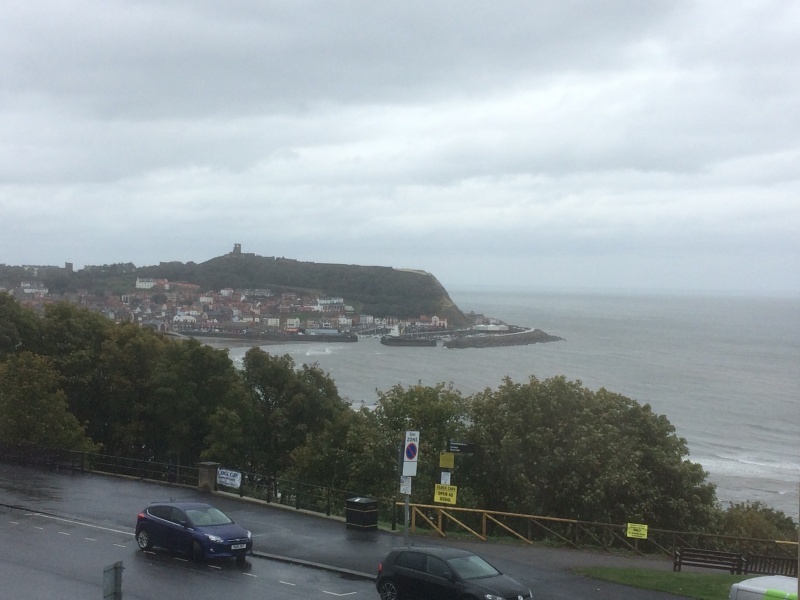 Still, despite the clouds, the air was walm and Scarborough bracing as ever. On the Friday afternoon, the funicular cliff railway was out of action so we had to drive down to the Spa, which was perhaps as well since we both had 'poorly' legs! (different ailments). 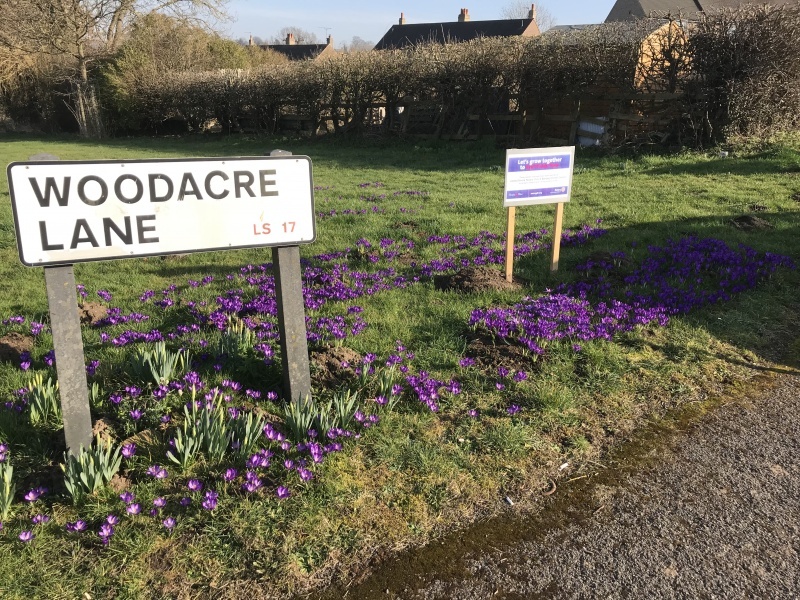 We spent a couple of happy hours in the House of Friendship looking at the various projects being promoted, and meeting up with old friends including PDG Phil Poole who had the box of 5000 crocus bulbs we had ordered for planting in Bardsey Village in aid of 'Purple Polio'. Another excuse for having the car near at hand. On the Saturday, the morning Plenary Session was very inspiring (pardon the visual pun above, showing DG Nigel Arthurs 'getting the show on the road'). We decided on two projects to be recomended for support by our club this year - The Yorkshire Air Ambulance, and District 1040 Sand Dam Project. We enjoyed a simple Fellowship Lunch in the Oceon Room at the Spa, before more 'House of Friendship' chat, and then the drive back to Leeds, thoughly 'inspired'. On Wednesday 29th August, six of our members, along with three wives, visited this garden in North Leeds. 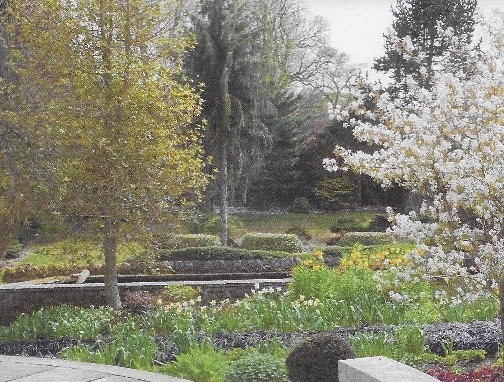 Run by the horticultural charity Perennial, York Gate was named by the Times as one of the 'Top Ten' gardens to visit last year. We had a wonderful time being shown around by the very knowledgable Head Gardener, Ben Preston. We were blessed with beautiful sunshine, a lovely summers day, and everyone enjoyed the experience, topped off with tea and scones in the tea room. Thanks to Ken and Alison Garrett for organising the trip. On Friday 20th July 2018, our Club President Alastair and Immediate Past President Peter attended School for their End of Year and Leavers Assembly. 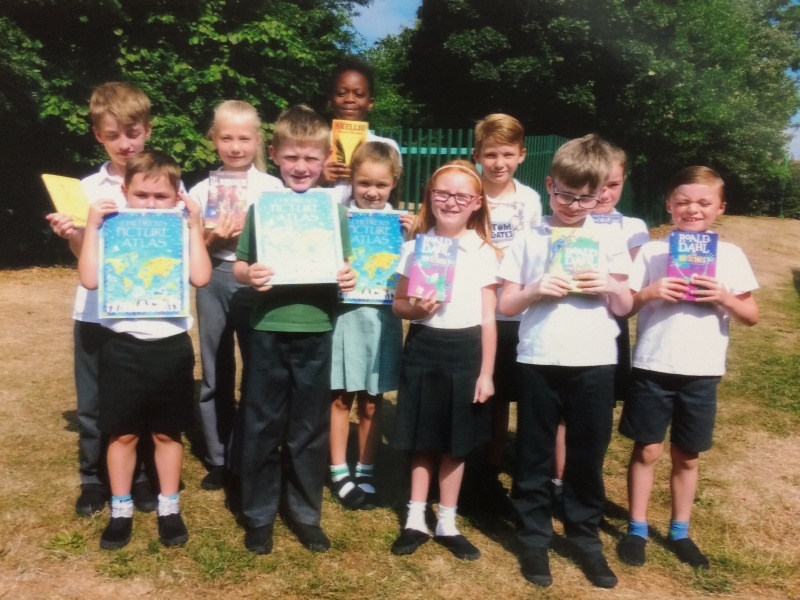 They were there to present books, one each to three children in each of the school’s years, who have worked really hard on improving their reading skills this last year. All the prize-winners were chosen by their year teacher. The reason for the attendance and presentation of awards was a small part of our commemoration of the life of one of our members who is no longer with us, namely Bill Baker, whose name appears on an insert in each of the books presented. Bill, as anyone who knew or had met him, was a larger than life individual, and a stalwart of our Club. He would have loved to have been with us that morning to see the smiles on the faces of the children receiving their book. A really lovely way to start the day. President Alastair writes: “The school Assembly was absolutely brilliant. Mrs Sheerin, the Headteacher, can be proud of her own efforts as well as those of the staff and children producing a school with such wonderful attributes. On Tuesday 3rd July 2018, five of our members, including outgoing President Peter Whelan, attended Ireland Wood Primary School in North Leeds. They went to present awards to the “special children” who had been chosen by their physiotherapist for doing well with their exercises during the year. The school accepts several children with educational special needs into mainstream education. All the children we meet on these visits are delightful and accept the awards with great pleasure. Mr Blackburn, the Headteacher, also thanked the Club for the gift of items which have helped the children to enjoy more school days out with their classmates: a)Two ‘Go-Pro’ cameras, with accessories to enable them to be fastened to the chest or head of the child, gave great pleasure to everyone, when videos were later replayed of them riding on a ‘zip-wire’ somewhere in North Yorkshire. b) Two ‘Oskoog’ Music Tactile Cubes enable the children to create, learn, and listen to music and to ‘play’ instruments. c) Two flexible Tablet holders, which can be fastened to wheelchairs and can hold a Tablet in virtually any position required – a great benefit certainly to one of the Award recipients. 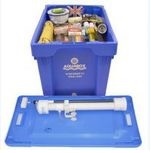 Our Club members are again looking to fill three Aquaboxes in this Rotary year (2018-19). We have completed this number of boxes each year for a number of years now. We deliver the completed boxes to the Aquabox Depot in Derbyshire, and should be able to do this in the late spring of 2019. Below is an extract of an email received by Aquabox with a quote from one of the recipients in Somalia of the boxes we sent in 2012: "When I was pregnant, I had worries to cloth my babe. We dont afford food most times so monies for cloths is hard to get. I thought the box was just for water and was happy when I found the towels and the clothes. I cried and hided them for after the delivery. This is the first time I ever had something new to wrap my baby in. My oldest son Ahmed will not leave the shelter without his new books and bag. He is too proud when he carries them with the other boys. Even me, I can share the cooking utensils with my neighbors. It feels like being home again. Truely these are blessings for all of us!" Makes you feel good that the efforts of a few people in Yorkshire can have such an impact on the lives of people in need so far away! Used Spectacles for Vision Aid Overseas. So far 3 boxes of used specaclrs have been sent to VAO. (Last year 2017-18, we sent 12 boxes). Immediate Past President Bill thought he was getting a big Christmas present from fellow Rotarian Arek Hersh, MBE, when he arrived at the Club Chistmas party on 14th December 2017, being presented with a big white plastic bag. He should not have got his hopes up so high!, but was delighted with the contents. Arek had collected some discarded, used spectacles from his optician earlier and gave them to Bill for onward transmission to Vision Aid Overseas. Bill parcels up the spectacles collected by members in boxes containg between 150 and 200 pairs each, and sends them to VAO via a local Optician. VAO recycles the specs, and the profits help with their work restoring vision to people abroad, especially in Africa. The money helps to train Optometrists, the performance of eye tests and the presciption of new spectacles (made locally). 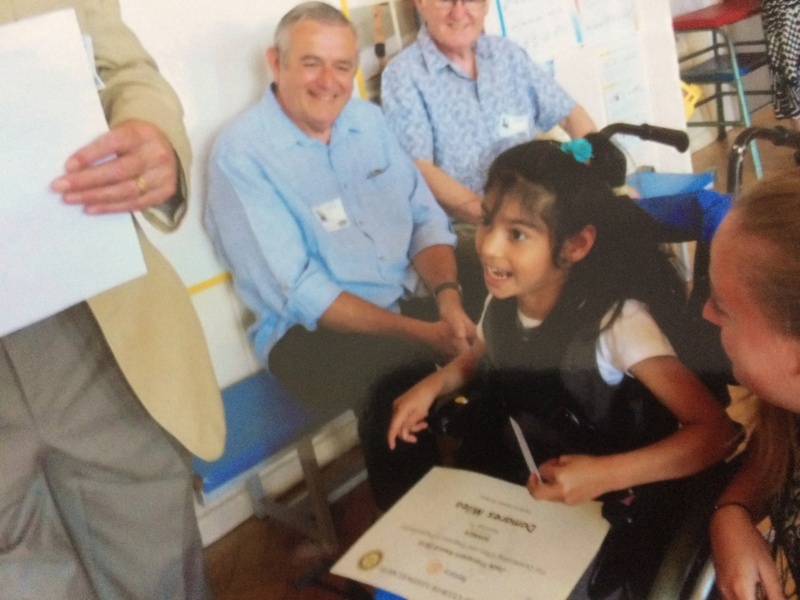 The Club has been supporting VAO in this way for over 20 years, and the last parcel sent off on 15th December was the 7th such in this Rotary year (July to June).To learn more about VAO visit www.visionaidoverseas.org or click on the link. 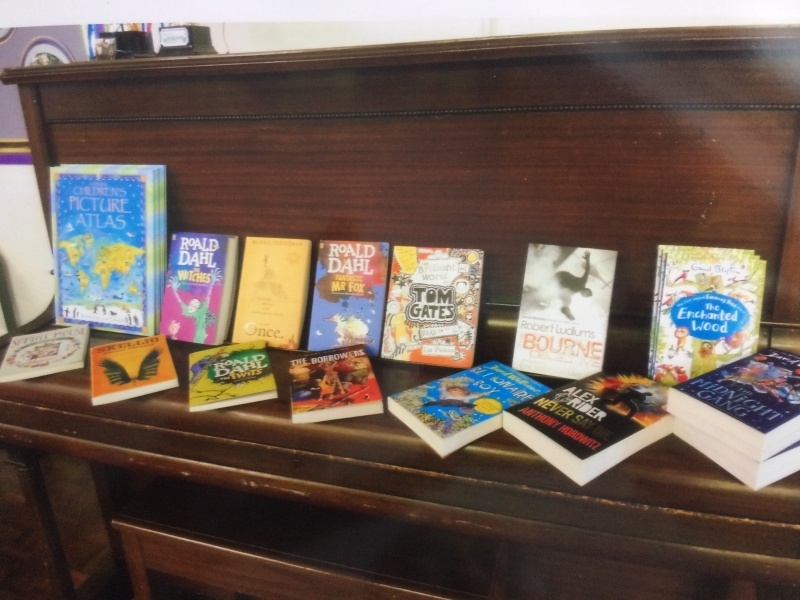 A number of our members continue to help out at two local schools by hearing children read once a week. This initiative started in September 2013, and is proving to be a very valuable and rewarding experience for the students, the schools and the Rotarians involved.To read more about this initiative: Click Here. The 2017 Technology Tournament for Schools was held on Tuesday 13th March 2018, at the John Charles Centre for Sport, Leeds, and our Club was represented by a member as part of the of the Judging Teams, as well as helping with the organisation of the day. A new record number of teams took part. The nine Rotary Clubs in Leeds Area join forces to put on the Tournament. Next Year's Event is scheduled for Tuesday 12th March 2019. OUR BULBS ARE COMING UP! 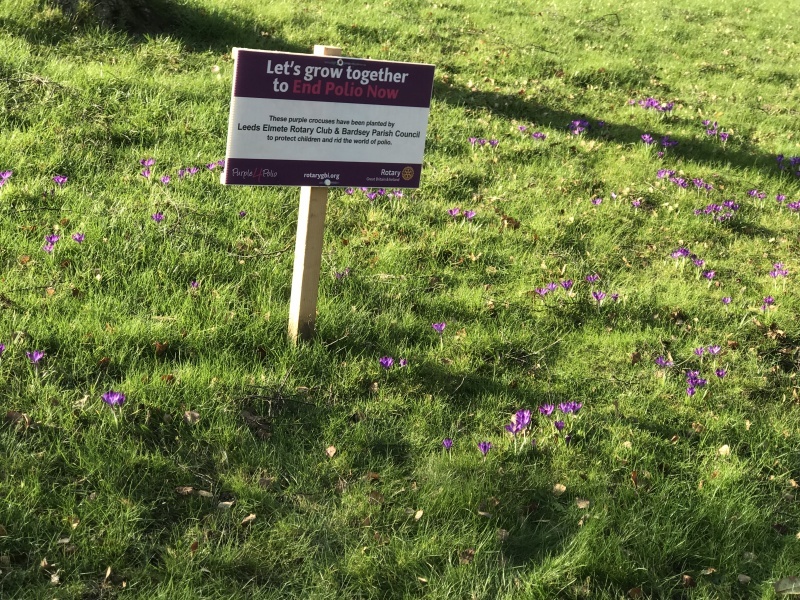 The bulbs we planted on 17th October 2017, with the help of Bardsey Parish Council, are begining to grow alongside those we planted last year (see lower down on this page) in the verge at the end of Woodacre Lane and outside the village School.Unfortunately Mr and Mrs Mole have been having a field day where we planted (well it is their field! 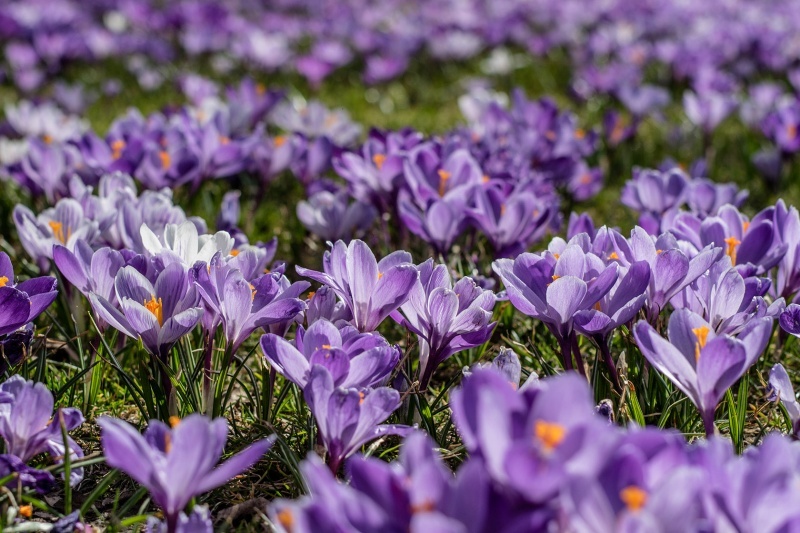 ), but hopefully there will be a nice show of purple flowers over the next few weeks. 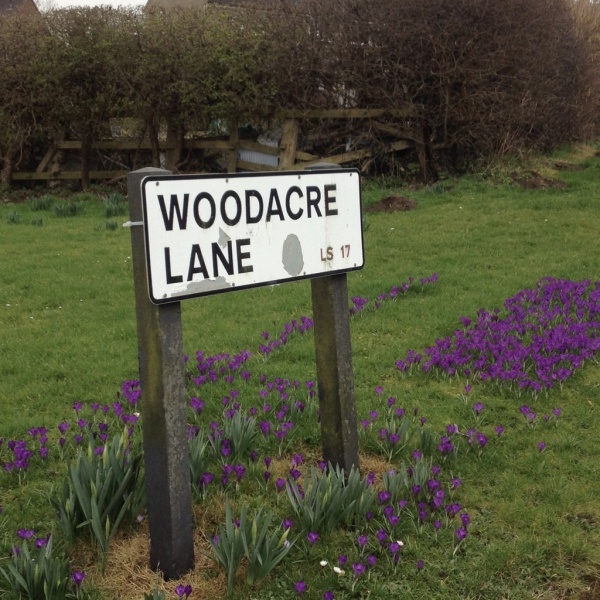 The day after the storms caused by the remnant of Hurricane Ophelia, 4 members of the Club and 4 members of Bardsey Parish Council braved the gusty wind and planted 4000 purple crocus corms on the grassed area at the end of Woodacre Lane, Bardsey. We had planted some there last year. A notice will be erected in the spring, when they start to flower, to tell people about this effort and Rotary's 'End Polio Now' Campaign. We have also given Bardsey Primary School 1000 bulbs to add to those we planted with the children's help at the school last year. 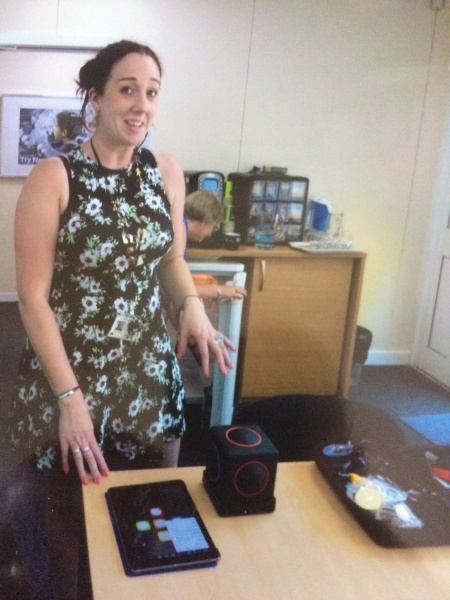 A teacher from Ireland Wood School attended one of our meetings recently to give us a talk about the School and how the children with Educational Special Needs are incorporated into the daily life of the school. A talk appreciated by all. When we went to Ireland Wood to present the Physio Prizes in July, knowing we were bereft of a collecting vessel, the Teacher who had talked to us presented us with a ceramic Owl to replace the missing animal. So from now on 'Olly' the Owl of Good Fortune will do the collecting. Thanks Jane. Our Club is one of very many clubs in Great Britain and Ireland currently using the RIBI website template, each club being required to make an ANNUAL payment of £50. This is raising approximately £60,000 for The Rotary Foundation each year! The Club has decided not to have annual Charter Dinners in future. We meet on Thursdays at 19.00 pm. for 19.30 pm.